Baseball Hitting Mechanics can be improved with top quality hitting drill work. We consider the following 12 baseball hitting drills some of the absolute best for improving and correcting baseball hitting mechanics. close attention to minor details and to the total picture. I feel that three things are extremely important in teaching hitting. Enthusiasm, correct consistant fundamentals, and variety in drill work. We as coaches should get excited about hitting. We should learn the correct fundamentals and stick with them. We should use different drills to develop hitting skills and prevent boredom from occuring. Here are 12 hitting drills that I feel every team should use in a year round training program. The top hand on the grip is the hand that takes the bat to the ball. It is improtant to develop strength and skill with this hand. To do this we do a one-handed isolation drill. The batter uses just the top hand. Gripping the bat at the top of the grip and using the bat like a tomahawk, the batter tries to get over the top of the ball and hit it into the ground. The batter has a coach or player soft toss the ball above the waist. The batter hits the ball from the top and drives its straight into the ground. This drill is best performed with the Hit2win Handheld Trainer from Nedco Sports. Suggested - 25 Swings - 3 Times a week. A hitters power comes from the bottom or pull hand. This drill develops bottom hand strength. This drill when done on a hitting machine, the machine should be set at a high strike setting. The hitter uses only the bottom hand in its regular position near the knob of the bat. We recommend the BatAction Hitting Machine for this drill. It works absolutely perfect! The coach must make sure that the ball is above the batters waist. It is best for the ball to be numbers high. The batter steps into the ball and hits its one-handed. Suggested - 25 Swings - 3 Times a week. The hitter is given three pitch locations to practice hitting; inside, away and middle. The ball may be presented to the batter using soft toss, batting tee, Hit2win Trainer coaching trainer, or Bataction Machine. On the inside location, the batter must learn to involve the hips and turn on the pitch, pulling it. On the middle pitch the batter hits the ball dead up the middle. On the away pitch, the batter makes sure to take the ball to the opposite field. The coach may want to put spots on the ground showing where the batter attacks each pitch location. The inside pitch is attacked on a spot located in front of the plate. The middle pitch is attacked on a spot located just behind the instep of the hitters front foot. The away strike is attacked on a spot located just inside of the hitters back foot. The batter can also use a Hitting machine and change location to the machine to get multiple strike contact work. Suggested - 20 At Each Location - 3 Times Weekly. The hitter learns to concentrate and keep the weight back. The coach tosses two balls. The coach calls top or bottom after the balls are releasd. The hitter hits the called ball into the fence or screen. This drill can be done from different locations. The coach should also fake toss and change the release points as well as vary the speed of the balls. Squash The Bug- The correct action of the hitters back foot. Trigger-The hitters final inside turn movement before the swing. See The Ball Flat-See the ball until it goes flat against the bat and comes off. 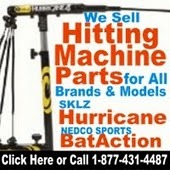 Many of our suggested top hitting drills can easily be performed with the Hit2win Trainer by Nedco Sports. We highly recommend this product for all ages. For more information, CLICK HERE! BatAction Hitting Machine - The only hitiing machine 100% Guaranteed to improve hitting skill, bat speed, raise batting averages and reduce strikeouts! One of the best misconceptions in baseball is that to benefit from batting practice the pitcher must be at regular distance and throw game speed. Much more can be accomplished when the pitcher throws from half the regular distance. At this distance the pitcher has better control and more work is accomplished. The ball is thrown at a steady appropriate speed. The speed at this distance should make the batter develop a quicker bat and great skill. The coach should never do this drill without a L-screen. This drill can also be performed with regular or golf-ball sized wiffles. The purpose of this drill is the increase of bat speed. This drill is best performed with soft toss or the BatAction Hitting Machine. The batter hits a ball that is coming from his back side going toward the pitcher. The hitter must see the ball and catch-up with it before it gets by him. The speed of the ball is increased to challenge the hitter more and more. When performing this drill with a BatAction Hitting Machine, it is recommended that you remove the machines power bands to increase your swing counts and to vary the balls comeby speeds. This is one of my favorite drills. The hitter assumes a comfortable and correct stance each time. Then the hitter closes the eyes. The coach or Hit2win Trainer coaching trainer holder will change the strike height and location each time. A verbal command is given, the hitter opens the eyes and hits the ball correctly wherever it is located. The batter must use the correct swing to hit inside, middle, and away pitches. The holder will also locate the ball out of the strikezone. Any ball above the hands or on the ground is a ball and should not be hit. Suggested - 15 Swings - 3 Times a week. "The best you can buy for under $300!" For More Info Click On The Photo Below! The hitter's "backyard basketball goal" makes home batting practice as easy and convenient as shooting a "game of horse"! What could 25,000 more practice swings a year do for your game?Think about it! This drill is used to shorten-up a hitters swing. If the batter is too long to the ball or has that A to B to C swing that is considered a slow-pitch softball swing, drills can be used to make the hitter shorten up. The batter sets up with his hands 8 to 10 inches from the fence with the fence behind the batter. The fence should run parallel with the batters back foot. If the batter casts the hands backwards or loops the bat, he will hit the fence or barrier. One of the most common faults with young hitters is stepping out. This drill is used to combat that bad habit. The coach may use a BatAction Machine, Coach Nick's Hit2win Trainer, or Stay-Back Tee. The hitter sets up to start the drill one step behind where he should be when he hits the ball. The hitter will step toward the plate with the back foot first then the front foot. When the front foot hits the ground the batter will attack the ball. There should be no hesitation. Step, step, HIT! The hitter will develop the habit of stepping into the ball when he attacks it. His momemtum is going toward the plate during this drill so it is very difficult for the hitter to step out. This is a great drill to develop bunting skills. The drill involves 5 players in each group. The players may use the pivot or square around bunt technique. The batter must bunt the ball to each of the four fielders. The hitter bunts one to each and then takes the left fielders (facing the batter) place. The right fielder comes to bat and the other move over one place. The coach should emphasize that the batters bunt the ball softly to the fielders. The bat should be keep at a 45 degree angle and the batter should change height by bending the knees. Fielders should catch the ground ball, bare-handed, out front, then square the feet around and throw the next strike to the hitter. This makes a great warmup drill for the beginning of practice. Defensive skills should also be stressed. The drill begins with the trainer ball on the ground. The holder will raise the ball to the batters numbers. The batter will hit the ball when it gets to certain called spots, eg. knee, belt, numbers. The speed that the ball is raised is varied to make the batter wait sometimes and react quickly at other times. The drill is great for developing concentration, bat speed, and patience. This is a great game simulation drill that teaches hitters to be agressive and to hit under pressure. Two teams face off in a 7 inning game with each batter coming into the box with a full count. Action is quick and players must be alert both offensively and defensively. The count may also be changed to 2-2 and each team can be given one out to start the inning. This is a BatAction Machine drill. The machine should be set at a height suitable for all players participating in the drill for that day. The machine is set with a one-band setting that allows it to rotate multiple times on contact. The players compete against each other. In the drill the goal is to make good contact as many times as one can without fouling out. Good contact is a swing and contact that makes the machine rotate at least once. The hitter that has the longest streak that day is the champ. This is a great ofF season skill building activity. It develops both offensive and defensive skills. The game is played with 3 players on a team. On defense, one pitches and two play defense. The object of the game is to be the first team to score 21. You score by hitting a linedrive or ball in the air that hits the wall in a designated or target area. The target area is normally a 6x12 rectangle that is attached to the wall or fence. The target may be larger if space so allows. Ground balls are not outs. They serve to keep the inning alive. You do not get a run for ground balls. Flyballs that go above the target are outs. Balls may be batted down by defenders to prevent a score. However, batted balls that touch the target before they touch the floor are scored as a run. The winning team must win by two. A tournament bracket is drawn and teams play for the championship. Coaches and parents are encouraged to play on teams. Each team may use only one bat. The bat never touches the ground or floor until the inning is over. * Emphasize quality not quanity when it comes to practice swings. are hit and the coach may use verbal commands such as ready, trigger, find, see, hit, finish or freeze. foot has turned or squashed the bug. the arm and finds the ball and release point.